Is not where I’d ever thought I’d be if you asked me even a few months ago. Let’s rewind: a few weeks ago, I was flying out on a Sunday to attend a business mastermind retreat with my mentor, Christine Kane. Just two days before I was scheduled to leave, I was contacted to see if I’d be interested in introducing Christine for the opening segment of the retreat, all about packages. The “rules”: use 5-6 minutes, speak from your heart, and introduce Christine. I didn’t hesitate. I said yes. I was incredibly honored to be asked. With very little time to process, I went about my day, prepared to leave, and flew out on Sunday. On Monday morning, I took the stage with a few bullet-pointed notecards. But it only took a few seconds to realize I wasn’t going to lay an eye on them. I let go. I saw the women in that audience, knew my story of overcoming obstacles and building packages for Harris Studios could help them, and I told my story. Could I tell you what I said on that stage today? Hardly. But it resonated. Because I stepped outside of my comfort zone, embraced my originality, and owned my voice. Realizing the power of breaking down that barrier lit a fire inside of me, one that extended beyond my business and into my personal life. While many step outside of their comfort zone to find excitement, there’s also sanctity in stepping outside to find solitude. For me, that happened in one of my favorite places in this world: Brantingham Lake in the Adirondacks. And it happened in the form of a vintage Adirondack guide boat. I was browsing Facebook one day when I saw the boat for sale. I took a chance and made an offer. It was a big decision. But it was easy. Within days, I was rowing a historic guide boat — my boat. I’m rowing backwards in my wicker seat, knowing I can stop and float at anytime while I write, paint, or read. I slow down. And in that way — alone in the middle of a lake, not on stage in front of 300 people — I find and own my voice. The true beauty in stepping outside of your comfort zone is this: when you let go of doubts, ignore judgments, and open your mind, you become your most authentic self. Doing this for your business means connecting on a deeper level with the audience you’re most qualified to serve: those who share your beliefs, feel resolve in your message, and can benefit from what you have to offer. Ordinary doesn’t sell anymore. Safe isn’t compelling. It’s only by putting yourself and your business out there in a genuine way, whether it’s through speaking in front of an audience, sharing your vulnerabilities on Instagram, or trying something new with your services, that you can realize your full potential. Your work will be better for it. You’ll connect with the audience you’re seeking in a more authentic way. And, best of all, you’ll discover opportunities you didn’t previously think were in the realm of possibility. And when this extends into your personal life? This means deeper relationships; more self-confidence, and a happier life. Let go of pretenses. Ignore self-doubt. Step outside of what would normally be expected of you (expectations set by both others and yourself). Then, and only then, can you realize the potential of who you are and what you have to offer. It took stepping outside my comfort zone to prove to myself that I have a voice. A powerful voice. I can heal. I can help. I can share. And through that, I can become a stronger business woman. I can become a stronger mentor. I can become a stronger friend. Try something new. Explore uniqueness. Use your voice to express who you are and where you’re going. 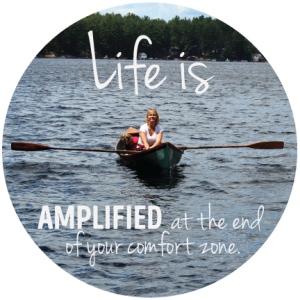 I have one edit to this popular quote: Life is amplified at the end of your comfort zone. I had — and have — a wonderful life within my comfort zone. But it’s only when I step outside that I see the potential for what it can be; what I can do. It’s amplified all that I have, and all that I hope to be. What’s one thing you can do today to step outside your comfort zone? How will that impact your brand, and your voice? Lately, I’ve been stretching out of my comfort zone daily and sometimes it’s terrifying. This was exactly what I needed to read! Thank you, Cindy! (And the beginning of stepping out of my comfort zone was leaving my daughter for the first time to attend Christine Kane’s retreat where you spoke).. And it was one of the best decisions I’ve ever made! Thank you for your awesome comment. We are all empowering each other, cheering each other on! I loved meeting you at the retreat and am so impressed with your talent. I look forward to watching you Fly! When I saw your post on Facebook this morning, I knew this was something I had to read. It has been a challenge for me in many areas of my life to step out into the unknown. There has always been a barrier of fear…fear of failure, fear of looking silly or making a mistake. I remind myself that it’s ok…no matter what happens. When I do take a chance and face fear, in some way it is always rewarding as I feel more confident and proud of myself for doing something that feels uncomfortable. Thank you for posting this and sharing your experiences. It’s inspiring to read about others breaking through self-imposed barriers and experiencing the success of it. I know you are ready Debbie! By getting it out you have taken the first step to stepping into your power.